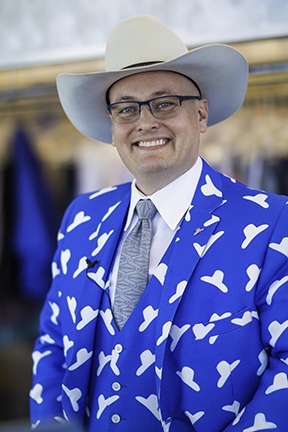 Yale Cleaners expert Bill Rothrock, III is a third-generation dry cleaner that started learning the business at a young age from his grandpa Jim. Bill would follow his grandpa through the main plant and watch him remove stains from clothes. Watching his grandpa work his magic to remove a tough stain, is what inspired Bill to follow in his footsteps. In 1992, Bill went to the Drycleaning & Laundry Institute where he studied the science of drycleaning and textiles, graduating first in his class. That same year, he was selected to be a drycleaning exchange student with the International Drycleaning Congress. Bill traveled to Australia and England spending 2 months furthering his studies. Recently, Bill challenged himself to become a Certified Garment Care Professional (CGCP). To achieve this distinction, Bill had pass three written exams, pass a cleaning performance evaluation, successfully remove six common but challenging stains and meet several other business/community standards. These rigorous requirements are set out by The Drycleaning & Laundry Institute. Bill is a Certified Professional Drycleaner, Certified Professional Wetcleaner and a Certified Environmental Drycleaner. Having all three of these certifications makes him a Certified Garment Care Professional and a Yale Cleaners Expert.